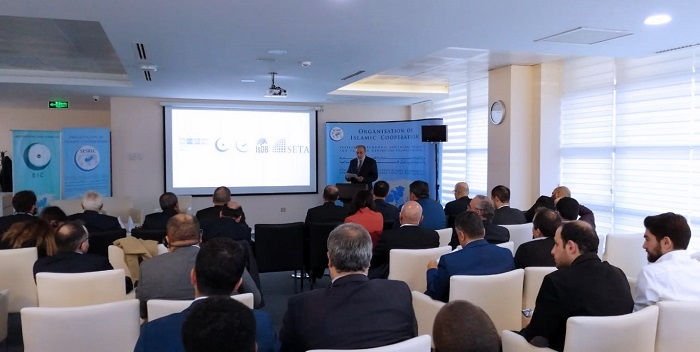 A launch event for Security Sector Reform (SSR) Report for Libya was held on 18 March 2019 at SESRIC HQ in Ankara Turkey with the participation of ambassadors of the OIC Countries, Turkish and Libyan authorities, as well as heads of various institutions and think tanks. The main purpose of the event was to share the outcomes of the Security Sector (SSR) Report Project for Libya, an initiative between SESRIC and the Libyan Programme for Reintegration and Development (LPRD) carried out with the technical support from the Foundation for Political, Economic and Social Research (SETA), a Turkish policy think tank based in Ankara. The Report aims to provide a technical document on the Libyan security sector to strengthen discussion and collaboration among concerned stakeholders to support the reconstruction of Libya. The research project is part of the BINA SME Develop Project carried out in partnership between SESRIC, the Islamic Development Bank (IsDB) and the Libyan Program for Reintegration and Development (LPRD), an initiative that aims to help the development of Libya in various areas, including security sector.